The latest collaboration between Steve Coogan and his Hamlet 2 director Andrew Fleming is a sticky sweet, soft-centred confection that coasts along on the skill of its two stars. Coogan plays Erasmus Brumble, a TV chef with a moniker that belongs in the world of Harry Potter and a manner that wouldn't seem out of place in La Cage aux Folles. Conceited, camp and endlessly self-centred, Erasmus relies on his long-suffering director and lover Paul (Paul Rudd), even if their relationship is marked by bitching, bickering and insecurity. Everything changes when ten-year-old Bill (Jack Gore) arrives, claiming to be Erasmus's grandson and desperately in need of a place he can call home. Could the carefree couple possibly grow up and open their hearts to the youngster? There is nothing surprising about Ideal Home but it is often very amusing. Every moment of awkward embarrassment or heart-tugging emotion seems designed to end in a pithy punchline giving the film the air of a slick television sitcom. What saves the day is the commitment of the performances. 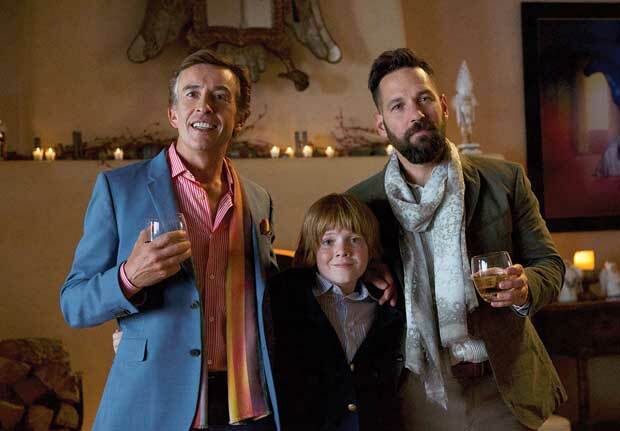 Coogan is on fine form as a cheerfully irresponsible, outrageously catty individual who jumps into his role as an indulgent Auntie Mame-figure to his grandson. He has matured into such a fine actor that he also teases out some of the vulnerability and bluster beneath Erasmus's raccoon-clad, Teflon-coated exterior. He is even willing to accept Bill's ceaseless devotion to the delights of Taco Bell. Rudd also fully inhabits the skin of the caring, loyal and endlessly exasperated Paul. The duo have real chemistry and Gore fulfils the role of the unwelcome intruder who may be the best thing that ever happened to them. Ideal Home is completely predictable and very sentimental, but comfortingly entertaining as it breezes past. Limited release from Fri 6 Jul. Self-centred TV chef Erasmus (Coogan) relies on his long-suffering director and lover Paul (Rudd), but then has to take care of his ten-year-old grandson Bill (Gore). Completely predictable and very sentimental but highly amusing, with Coogan on fine form as the catty but vulnerable chef; he and Rudd have genuine chemistry.